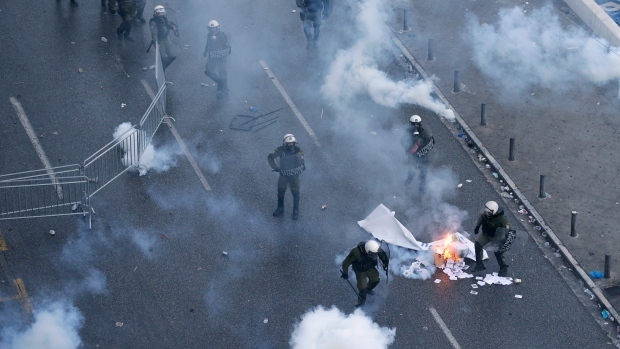 ATHENS, Greece -- Protesters clashed with police outside Greece's parliament during a rally that drew tens of thousands of people Sunday against the Greek-Macedonia name deal. At least 25 police officers were injured and seven people arrested, police said. Some protesters also attacked photographers, injuring four, one of whom was hospitalized and also had his camera stolen. Macedonia and Greece struck the deal in June to end a decades-long dispute over Macedonia's name, which Greece says harbours territorial claims on its northern province of the same name. Protesters are against the deal because they believe that any use of the name Macedonia in the neighbouring country's name is a usurpation of ancient Greek heritage and implies territorial claims on Greece.